Hexus has teamed up with Toshiba to gift one of their fans with amazing SSD bundle! To enter in their latest Toshiba SSD Bundle Giveawaygrab your free entries by following few simple steps listed down below! Upgrading from a hard disk drive (HDD) should be easy and affordable and that’s where OCZ TR200 SSDs come in. 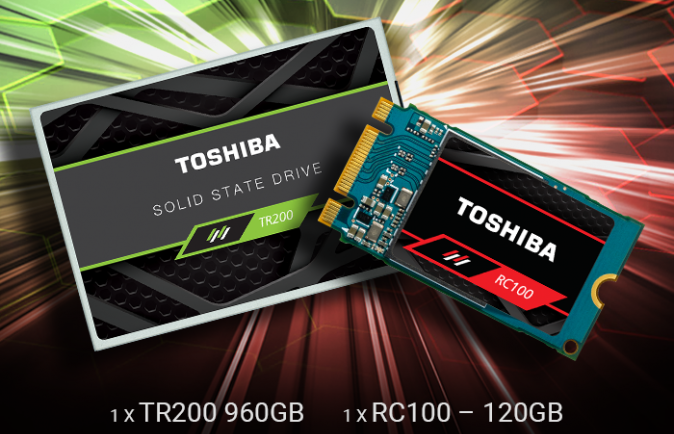 Designed to boost the speed of your notebook or PC over other HDDs, the TR200 Series leverages Toshiba’s advanced 64-layer 3D BiCS FLASH, to deliver well-balanced performance, reliability, and value that will transform your mobile or desktop system. With a 64-layer vertically stacked cell structure, Toshiba BiCS FLASH technology enables higher capacity, endurance, performance, and efficiency in the same footprint, delivering a state-of-the-art storage experience. Up your productivity with the TR200 Series and enjoy faster boot ups, file transfers, and system responsiveness. Say goodbye to hard disk drive lag and get a computing experience worthy of your time. STEP 3 – Input your details into the giveaway form and click the “Enter” button. The winners will be notified via email by April 22, 2019. The winner must claim their prize within 7 days of the promoter sending notification.